We need more passionate plays addressing LGBT issues. Deborah Salem Smith, playwright-in-residence at Trinity Repertory Company in Providence, R.I., fills this niche with the world premiere of her new play, Love Alone. Deborah takes on medical malpractice, gay marriage, and LGBTQ family rights. The play is about a routine medical procedure that goes tragically wrong, an ensuing lawsuit, and how the lives of both the patient's family and the doctor charged with her care are transformed. This is a lovingly drawn portrait of how we grieve and how we heal. I've been with my partner for a long time, and we have two young children together. So it's really important to me when I realized that I had not been writing plays with gay characters in them, which is really bizarre and embarrassing. So it was important to me to put a gay family in the center of the story. The character Helen, who has lost her partner of 20 years -- her grief is grief we can all, regardless of sexuality, recognize and empathize with. This is the story of two women who are deeply in love, and the unexpected death of one of them in minor surgery is a huge emotional tragedy for her partner, for the couple's daughter, and I think to some degree -- which I think is important -- for the audience, to experience that, too, and to let go of distinguishing gay/straight and just be reminded that a devoted couple, regardless of any of these labels you want to put on it, is a relationship that we all recognize and empathize with. Love Alone received an Edgerton Foundation New American Play Award to support its premiere at Trinity Repertory Company, and it was also recognized with an Honorable Mention by the Jane Chambers Playwriting Award. Deborah Salem Smith's previous honors include an Emerging American Artist Fulbright for playwriting in Dublin, Ireland, where she worked with the Abbey Theatre, Ireland's national theater, and served as a visiting academic at the Trinity College School of Drama. 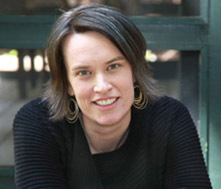 Her work has been recognized by a National Mellon Fellowship in the Humanities, a MacDowell Fellowship, a Colby Fellowship, a Major Hopwood Award,and writing and visual arts prizes from the University of Michigan and Princeton University. Love Alone runs from March 16 through May 27th at the Trinity Repertory Theater in Providence, R.I. For more information and to acquire tickets, click here.